The Radiation Alert Monitor 4EC is a hand-held radiation detector that is used to detect potentially harmful ionizing alpha and beta particles, and gamma and x-ray radiation with an internal Geiger-Mueller (G-M) tube, and has an energy-compensated sidewall for a linear reading of gamma rays and x rays (40-100 keV). This meter has a dual-scale, analog, needle-point display of counts per minute (CPM), and milliRoentgen (mR) per hour. Three selectable operational ranges detect the four main types of ionizing radiation: alpha and beta particles, and gamma rays and x-rays. Operational ranges of X1, X10, or X100 can be adjusted when the meter face peaks at the highest mR level. The Monitor 4EC has a red, flashing counter and a beeping noise to indicate each ionizing radiation event. It has a halogen-quenched G-M tube, and a thin, mica end window for sensing some alpha and beta ionizing radiation. It checks radiation levels in the environment and objects, such as particle accelerators, x-ray shielding, and industrial gauges. 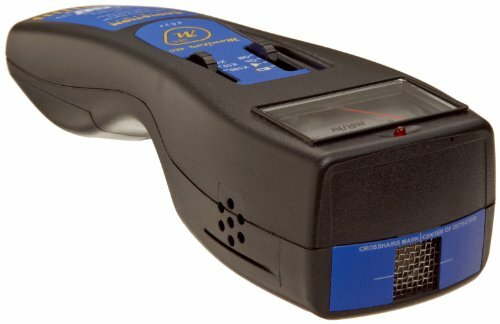 An audio indicator with an internally mounted beeper can be turned off for silent operation. The Monitor 4EC has a one-year, limited warranty. Reading Ranges 0 to 0.5, 0 to 5, or 0 to 50 milliRoentgen (mR) per hour, or 0 to 500, 0 to 5,000, or 0 to 50,000 cycles per minute (CPM). Accuracy Factory-calibrated by pulse generator, with accuracy + or -15% of reading full-scale, relative to Cesium 137. Energy Sensitivity 1,000 CPM/mR/hr (Cs137). The energy response for gamma and x-rays through the detector sidewall is flat within +61% or -26% over the range of 40 keV to 100 keV, and within +35% or -17% over the range of 100 keV to 1.3 MeV. Detection Alpha down to 2.5 mega (million) electron volts (MeV), with typical detection efficiency at 3.6 MeV at greater than 80%. Beta at 50 kilo (thousand) electron volts (keV) with typical 35% detection efficiency. Beta at 150 kilo (thousand) electron volts (keV) with typical 75% detection efficiency. Gamma and x-rays down to 10 keV typical through the window (non-compensated), 40keV through the sidewall. Normal background is approx. 5-20 CPM. Sidewall Detection Energy-compensated sidewall with 2 mm tin filter. 40 keV minimum through the sidewall of the detector. Energy compensation is only effective through the sidewall. Temperature Range -20 degrees to 55 degrees C (-4 degrees to 131 degrees F) and an internal detector. G-M Tube Halogen-quenched, internal Geiger-Mueller tube. The effective diameter is 0.92 cm/0.36”. Dimensions Dimensions are 209 mm x 71 mm x 50 mm (8.2” x 2.8” x 1.9”). Weight 198.1 g (7.0 oz). Output 3.5 mm headphone jack for use with observer software (not included) and Windows-based computers. Normal Background Radiation Approximately 5 to 20 CPM. Battery 9-V alkaline battery (not included) for approximately 2,000 hours of continuous use in a normal background. Window Thickness The thin mica window is 1.5-2.0 mg/cm2 thick. Radiation detectors, sometimes called Geiger counters or G-M counters, can detect a broad range of ionizing alpha and beta particles, and gamma and x-rays that may be emitting harmful levels of radiation. Many detectors sense ionizing radiation with an enclosed Geiger-Mueller (G-M) tube to count radiation particles or rays. Alpha and beta particles are measured in counts per minute (CPM) or counts per second (CPS). Gamma rays and x-rays are measured in milliRoentgens (mR) per hour, microSieverts (μSv) per hour, or milliSieverts (mSv) per hour. Alpha particles are positively charged and heavier than beta particles, and have a limited range of approximately 3 to 5 centimeters by air. Alpha particles can be shielded by objects such as paper and unopened skin. High-energy beta particles are electrons, heavier than gamma rays, and can take either a positive or negative charge. Beta particles can be shielded by aluminum or wood. High-frequency (short wavelength) gamma rays are the strongest and lightest rays. Gamma rays are more penetrating than alpha and beta particles. They can be shielded by dense materials such as lead, and large masses of concrete, hardened steel, or water. X-rays are man-made gamma rays, and have essentially the same properties and function. 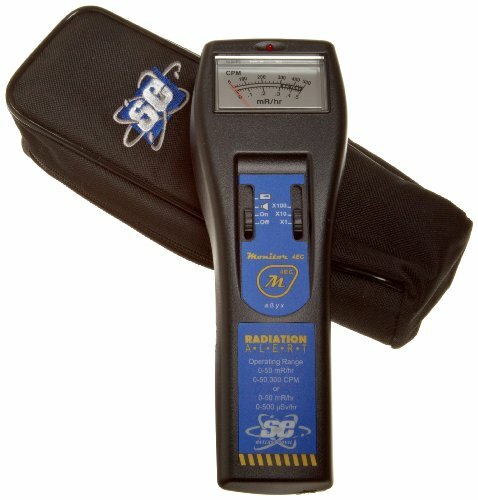 Radiation detectors commonly have either an analog or a digital display. Analog radiation detectors output with a needle-point scale, and digital units generate a numerical LCD digit display. Radiation detectors are commonly used by hobbyists for safety detection and rock inspection, and professionals in the in the nuclear, medical, mining, instructional, and research industries.